Like I said, the goal was a firearm that was a “Glock” in everything but name, from the ground up, including all the fiddly bits. This did limit a few of my choices, and resulted in a fair bit of trial-and-error to determine which aftermarket part would play well with another aftermarket part, but the end result appears to be a success. 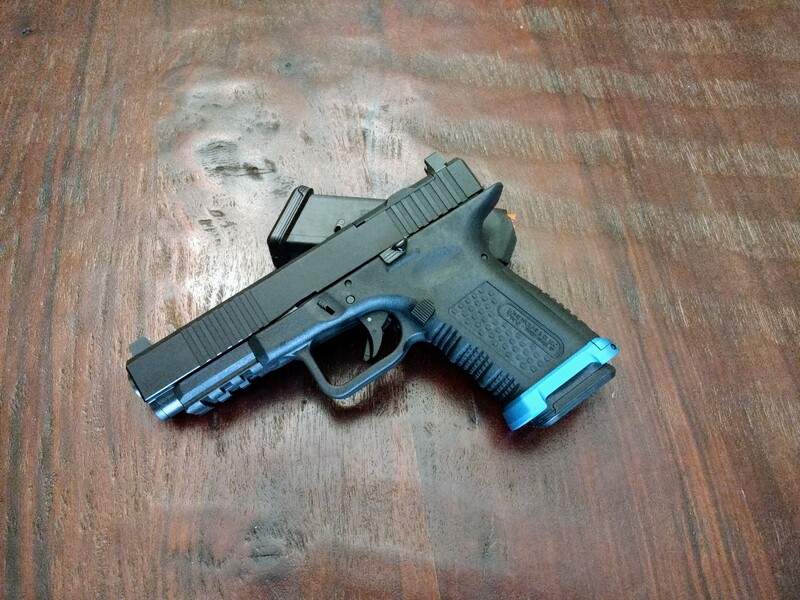 Frame: Compact (G19-equivalent) Lone Wolf Timberwolf, old model, built. $150. Since Lone Wolf was clearing these out in preparation for their new frames, buying it built-out by them was actually cheaper than buying a stripped version and building it myself, and certainly easier. NOTE: Unlike the 80% lower kits, this part must be shipped to an FFL, and you must fill out an ATF Form 4473 and pass a background check before taking ownership of it. It is legally considered a firearm, and serialized as such. Barrel: Lone Wolf AlphaWolf M19/L. $140. 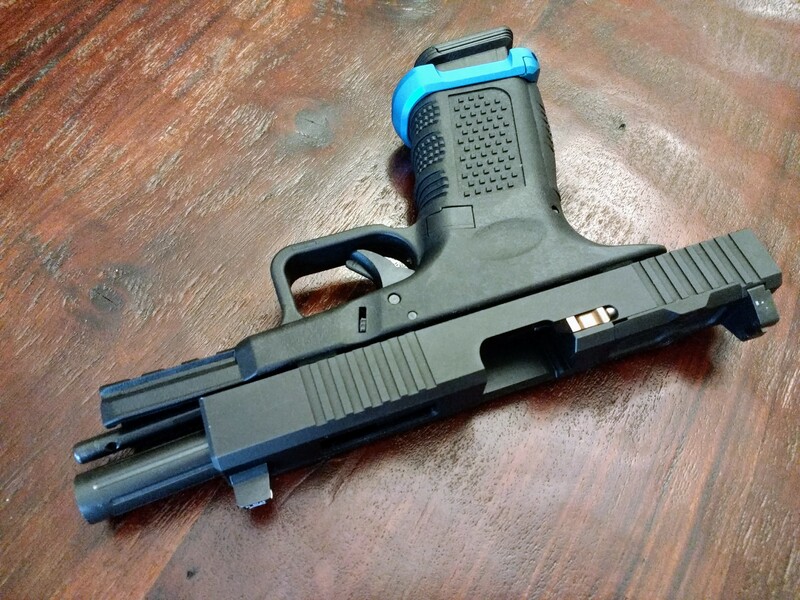 I wanted kind of an inverse Glock 19X – a compact frame and a full-size slide – because, apparently unlike Operators Who Operate Operationally in Operations, I find it harder to conceal grips than slides. 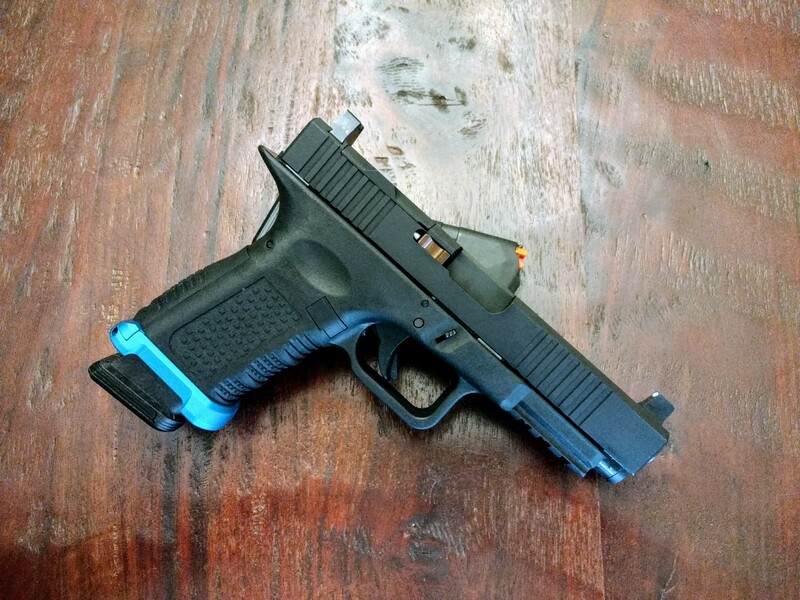 Due to that, I had to buy a specific barrel that could interface with the G19-style locking lugs – which are different from the G17 ones – while still giving me the proper length. Slide: Brownells Glock 17 RMR Slide + Window. $170. I have no idea if I will ever want to put an optic on this, but buying it with the option available seemed cheaper than trying to go back and add it later. The window is a purely aesthetic indulgence that only cost $10 over an un-windowed-but-RMR-caable slide. Optic Plate: ZEV Adapter Plate. $48. If I had not just gone for the easy, right-there solution, I might have considered one of these from Maple Leaf Firearms, LLC instead, both because an equivalent one would have been cheaper, and because I could have had a brass one for the same price. 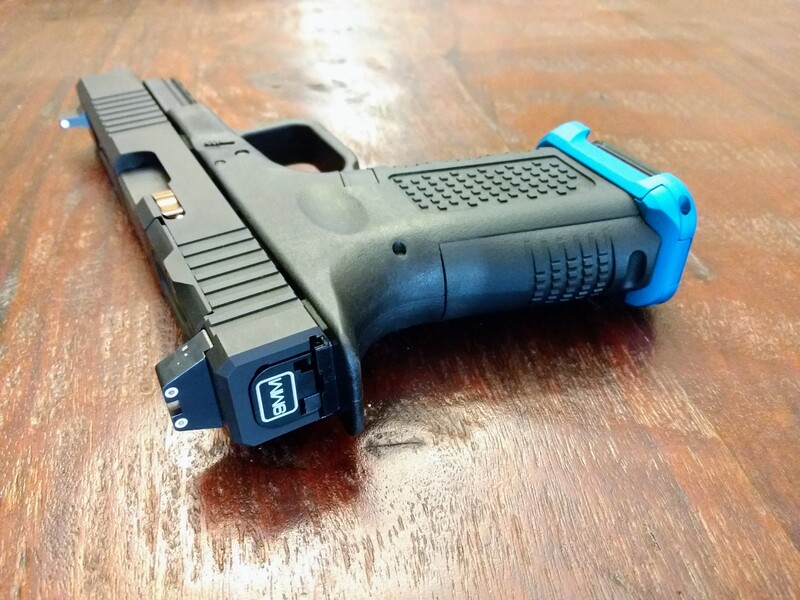 Dust Cover: Lone Wolf Slide Adapter Gen 3 to Gen 3. $55. Basically, if you do not have this, the gap between the slide and the frame will show off your recoil spring, plus the recoil spring assembly might not work properly. Make sure you get the right model for whatever generations your slide and frame are. Guide Rod: White Sound Defense Steel Guide Rod. $20. This is an uncaptured guide rod, but they give you a handy little hole through it that lets you “screw” the recoil spring onto the guide rod and then drop it into the slide. Note: I ordered – and, according to the packaging, received – a G17 guide rod, but it does not extend past the slide as it is advertised to do on normal G17s. This could be because of the G19-ish frame and different take-down lever location. Recoil Spring: ISMI 17lb Recoil Spring. $9. I figured I would start with the stock weight and go from there. Slide Cover Plate: Fixxxer Rear Cover Plate. $12. Perhaps not the classiest name in the world, but it was inexpensive, and it occurred to me that nothing else on the firearm – not even the barrel – indicated what caliber it was. Sights: Trijicon Suppressor Night Sights. $110. I may never put a red-dot on this thing, but it seemed to make sense to go ahead and get the sights that would allow for it. 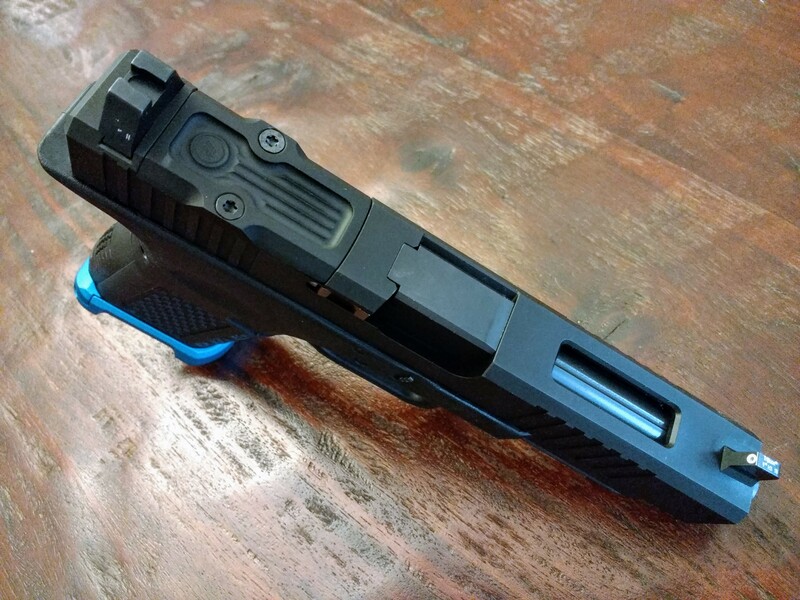 Magwell: Lone Wolf Blue Anodized Magwell for Timberwolf Frames. $10. Ok, this was almost completely unnecessary, and was mostly purchased because it looks cool. However, these magwells are being discontinued courtesy of the host frames going away, and I figured I should go ahead and grab it. Likewise, thanks to above-average hand size, I have drawn blood while enthusiastically reloading my Walther PPS, and I could see the same happening on this frame. And that is totally a rationalization. Shadow Gunworks Firing Pin Channel Liner. 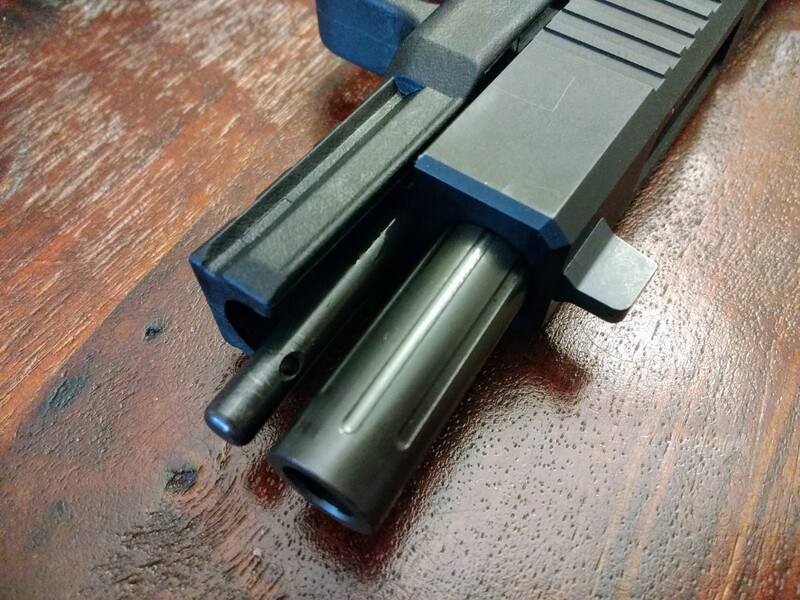 I do not know if the firing pin channel in the Brownells slide is a little to narrow, if this particular liner was a little too wide, or if trying to install it without the proper tool was the wrong idea, but it failed spectacularly. Lone Wolf Stainless Steel Guide Rod. This one perplexed me a little. You would think it would work, but the screw at the end of the guide rod repeatedly bound up on both the dust cover and the slide unless it was perfectly installed. Sometimes, I could only get the slide as far back as was necessary to get it off – thankfully. Other times, the screw stuck on the outside of the slide, meaning it could not go back to battery properly. This general unreliability caused me to go with the alternative above. So, yeah, it cost more. I do not think anyone is surprised by that. But it did not cost that much more – in fact, once you factor in the cost to mill the 19X slide to accept a red-dot sight and the cost of replacement suppressor-height sights, the Not-A-Glock barely cost more at all. Additionally, I was able to build it to fit what I wanted, learn a lot about the platform in the process, and it does not care what kind of bullets you throw down the tube. Again, the only part that absolutely had to have paperwork on it was the frame / receiver – that is legally considered a firearm, and there is a 4473 somewhere with my name and its serial number on it. And while I did purchase all the rest of the parts online, and there are undoubtedly records of all those transactions at those retailers, a good-sized gun store will have all the parts necessary, and you could pay in cash. In other words, if my clumsy, uncoordinated arse can successfully build a fully-operational Glock from bare parts, what hope do you think you have trying to regulate – if not outright ban – the production of firearms? Seriously. 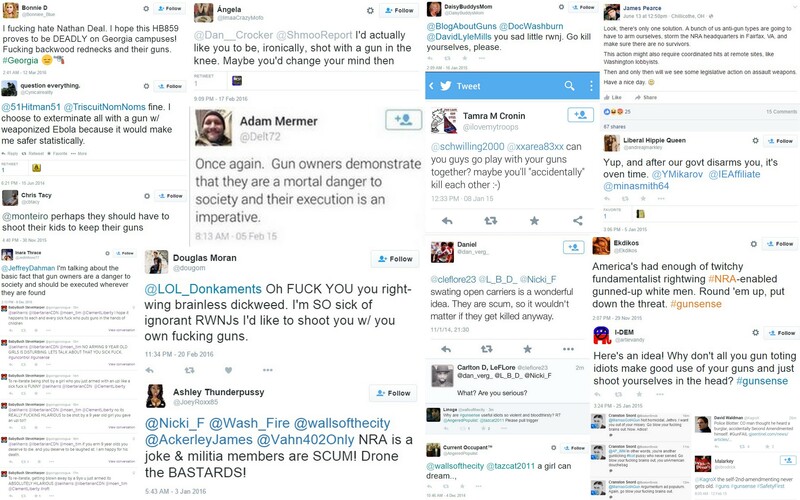 Re building your own, even in unfree countries: an example I point to whenever I get a chance is the late Phil Luty’s website “thehomegunsmith.com”, which got him in serious trouble in the UK, his home country, where freedom of speech does not actually exist. Very much worth looking at. It is, indeed, quite a useful resource, and another classic example of the “gun control” movement’s attempts at suppressing knowledge. That he built his firearms was his ultimate crime, but the once-Great British government would very much prefer that the information he provided was destroyed along with, no doubt, the actual firearms themselves. I built a P80 frame with just a hand drill, vise, Dremel with a small sanding drum and a set of files and fine grit sandpaper. No need for a drill press. The end mill bit they give you requires a fast drill press and a cross slide vise so I opted not to use that. Oh, I am sure that route is doable… I just do not trust myself that much with a Dremel :).